​A.P.E. Gallery is excited to present its first-ever exhibition of self-portraits by 50 area women artists, many of whom have national or international reputations. 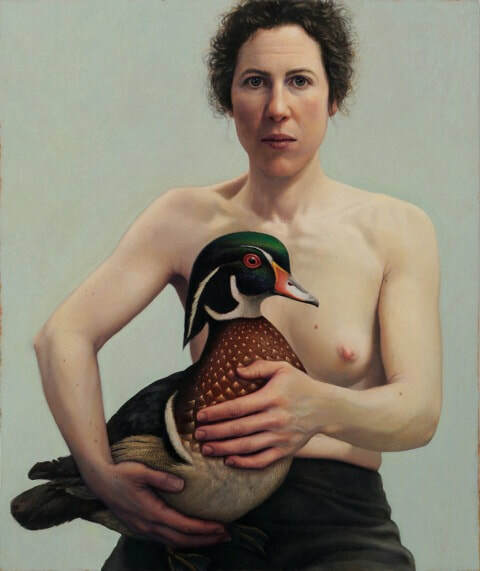 Curators Jane Lund, Rachel Folsom, and Betsy Stone, all figurative painters, have brought together a wide variety of artists, whose work includes many surprising variations on the theme of representational self-portraiture. A number of years in the making, the show provides women artists, who are often underrepresented in galleries and museums, an opportunity to show their artwork as a group while revealing themselves as individuals. The exhibit is also a celebration of the art of the portrait. According to the curators, one of the most compelling images is that of the human face. And self-portraits have particular power as they can reveal much about the artist - personality, character, social class, and the evidence of life’s experiences. In this age of cell phone selfies, the exhibit showcases a different kind of selfie - images made by the artist’s own hand. The exhibit includes work by the following artists: the late Frances Cohen Gillespie, a highly-regarded realist painter whose work hangs in the Boston Museum of Fine Arts; Katy Schneider, Smith College art professor nationally known for her representational oil paintings; Sally Curcio whose inventive sculptural environments have been exhibited nationally; Nanette Vonnegut, known for her evocative paintings, drawings, and prints; sculptor Harriet Diamond whose large political installations have received wide attention; realist painter Robin Freedenfeld whose work hangs in many private collections; Terry Jenoure who creates brilliant soft sculptures; Nan Hill known for her exquisitely-rendered still lifes and portraits; and many others.